Before I enlighten you on what I personally witnessed during the early 70's I do not condone the illegal killing of salmon parr or the killing of wild brown trout. As a young boy spending time through the Summer holidays on the River Tay I got a glimpse of the way the professional ghillies of Scotland used to personally look after their own individual salmon beats and the predation control & other river husbandry measures they took to achieve that. I was advised by a professional River Tay 'career' ghillie back in the early 70's that the brown trout was the most 'deadly' predator the salmon faced which I didn't at first accept because I was already aware at a young age of the damage seals can do as I'd seen salmon landed that had awful scratch & bite marks down their beautiful silvery flanks. It took a Summer night out on the River Tay for this brown trout 'concept' to truly sink home. I recall a Summer day in the early 70's watching half a dozen salmon parr being caught on a small hook and light monofilament on the beat I was fishing. When I saw this I immediately questioned the beat ghillie as I knew these were young salmon and it was surely not correct to do so. I was instantly growled at and advised I'd be shown why later. That was at lunchtime and by 5pm I saw what were once beautiful finger print patterned salmon parr now resembling pieces of dried leather packed in a tub of rock salt and mounted without their heads on wire devon minnow mounts and bound with copper wire. I was told that after I'd finished trout fly fishing that evening and I'd seen the first bat dancing about the tree tops I should report back to the fishing hut. I vividly recall the anticipation of wondering what lay ahead as I walked in the semi darkness back to the hut late that evening. When I got there the traditional Tay coble boat was at the ready minus the engine and the 3 main salmon harling spinning rods were in the boat with each having a salmon parr bait attached and the remaining 3 spare parr baits hooked onto the gunwale. The ghillie rowed to the top of the beat in the low Summer water levels and put out each of the 3 baits on a short line behind the boat. As he was harling slowly on the oars down through the pools he told me that the big 'cannibal' trout would be on the feed at some point between now and 4am and that they would only do so for 30 minutes before their feeding frenzy would cease for the night. I was completely intrigued and sat there wondering what on earth I was going to be witnessing. After a couple of hours of no action other than having to pick some of the Summer weed that appears in the Tay off a few of the baits I started questioning what on earth we were doing out in the darkness but the ghillie maintained we were getting closer to the action and I was to be patient. At approx 3am in the morning after nearly 4 hours of complete 'nothingness' one of the salmon rods buckled round. The fish was horsed in by the under ghillie to the spot light of the torch at the side of the boat before being netted but before that fish could be lifted aboard one of the other rods had gone too! It was 'explosive' action to say the least and exactly for 30 minutes as previously advised before everything went quiet again. The ghillie told me that it was the scent of the salmon parr baits that these 'ugly' big headed dark patterned Tay trout were homing in on and that these fish were long past a natural 'fly life' diet and primarily fed on the salmon parr that were present in the Tay. One of these 'cannibal' trout that were caught that night weighed 9lbs but the majority were between 3lbs & 5lbs in weight. It was now nearly 4am and the light blue early morning Summer sky was beginning to show. We were now away down at the bottom of the beat and the best part of a mile from where we'd started so the long journey back to the fishing hut on the oars began. Several big Tay trout had been caught which the ghillie told me would be highly appreciated by his family for dinner later that day! Eventually we arrived back at the fishing hut after 45 minutes of rowing and pulling the boat up through the fast water to the jetty. As I went to lift these trout out of the boat the ghillie turned to me and in no uncertain manner stated that those trout would have killed at least 100 parr between them last night which instantly sunk home as to why I'd been 'growled' at the day before when I dared to question the killing of 6. He also stated that every Tay ghillie used to conduct this practice through the Summer months each year but no one bothered these days and that was back in the early 70's! He also advised me that these big trout that were gregariously feeding on salmon fry, parr and juvenile trout could not be taken on a fly as they were way past that stage of dietary inclination and that the only time you could catch them was for 30 minutes through the night with a natural parr tail bait. He also advised me that his father had caught a 19 pounder one night and that these predators were largely unknown about by other anglers and the entire River Tay management. This same 'old school' Tay ghillie was a fanatical trout fisher and used to love to see the Tweed clad wicker basket dry fly fishers appear in May when the first big May fly hatches were on and he'd sit mesmerised by their true art form skill display as they presented their dry flies with their split cane rods to these feeding & beautifully spotted wild River Tay brown trout. If you really work the numbers regarding what one of these big River Tay 'cannibal' trout would consume throughout a year in juvenile salmon parr it switches the light on completely as to how smart the 'old school' Tay ghillies really were in their simple yet effective measures of making sure their beat's juvenile wild smolt outputs were optimised. Even figuring on a consumption of 2 salmon parr per day equates to the destruction of several hundred young salmon lives over the year. If that cannibal trout was removed in effect you're sending a shoal of 700 hundred more smolts to sea the following Spring from the very beat you've removed that 'cannibal' trout from as salmon parr tend to stick to the same areas they were born and are very territorial as are these big predatory trout. 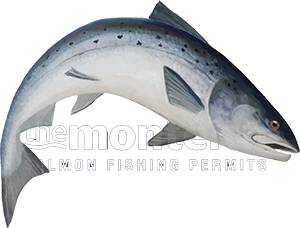 At a minimum rate of 2% guesswork return from the ocean that equates to 14 additional returning adult salmon within 24 or 36 months and we in our 'infinite' wisdom think that man made hatcheries are the only thing that can be done! If you removed dozens of these predators out of an individual salmon beat what returning adult salmon numbers would likely show up a few years later! Make no mistake about the fact that these big predatory 'cannibal' trout are still heavily populating the Tay & other Scottish salmon rivers and have thrived over the last 50 years. That same 1970's summer I watched this professional Tay ghillie in the river with his black rubber Dunlop thigh waders on armed with a heavy iron rake systematically raking up the gravel on his beat's traditional salmon spawning beds. He said this practise was again an important one for each Tay ghillie to annually perform on their own individual beat to take the natural build up of silt off these spawning areas before the back end spawning season began. A blast from the past I know but I just thought I'd share these personal boyhood observations with you.